Girls Wear Blue Too: Worth sunburn? - My Creative Space. Worth sunburn? - My Creative Space. Good Morning All. I have not had a sensational week, partly my own fault for not using my planner and not going to bed early enough. Also due to the minefield of child emotions and behaviours that have arisen through School starting, day care changing and the whole groove of new routines for all of us. When I am under stress and unhappy I carry tension in my shoulders and they had been aching and giving me a hard time so I was thinking I'd stop carrying a bag on my daily School walks. I decided I'd wear clothes with pockets for my essentials and carry my Water bottle to ease some of the extra pressure. 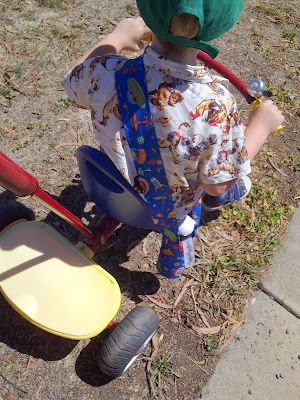 What I hadn't accounted for was carrying Mr3's water bottle also and partial pushing of the trike. A really uncomfortable juggling act. On Tuesday Morning I had the idea to make him a shoulder sling carry bag for his bottle so he could do it himself. I forgot about it after we got home until about 1/2 hour before we were due to leave. My machine was still out on the table from the washing hamper makeover so I jumped up pulled out this fabric, cut and sewed it up in 20 mins! Though don't look too closely as the strap is not stitched on too neatly or prettily! When Daddy got home that Night Mr3 proudly showed off his bottle bag and Daddy praised it then looked at me across the room and said you look a bit red ( I hadn't noticed until then ) I explained why and he said with amazement "Did you make that ?? I thought it was from the shops!" Ah what better compliment could I have than Lil boy loving it, lil girl wanting one and Dad thinking it looked too good for home made? High praise indeed. I think worth the sunburn. yes . the best praise . great bag! Aww yay, it looks cute! Hope your sunburn's okay - drink lots of water! How clever you are! 20 minutes? It would have taken me a week! LOL! 20 minutes ? I am so impressed, it looks great. It looks great. Take care of that sunburn. Weighing it all up I think you came out the definitive winner - ouchy shoulders not withstanding! It takes me longer than that to thread my machine! Maybe you could sell them on etsy! What a great idea, I crocheted a few but the straps were to narrow and rather painful fromthe weight...Thanks for the e mail....I fixed the problem, I appreciate it! What a great idea on the drink holder, and sewn up so quickly, I need to focus more, I always get distracted!! Looks great! I'm not surprised you got such compliments. Hey Tammy I am impressed! Yes and drink lots of water! Great idea Tammy! I think my girls could use one of those so I don't end up carrying all the drink bottles which always seems to happen. Looks fantastic! Hope the sunburn has healed quickly. Practical and attractive! Perfect for busy little boys. I hope you have left the less than great week behind Tammy and are enjoying the weekend. How clever are you, mid high stress levels, to think of a solution and make it happen. And well done to Daddy.